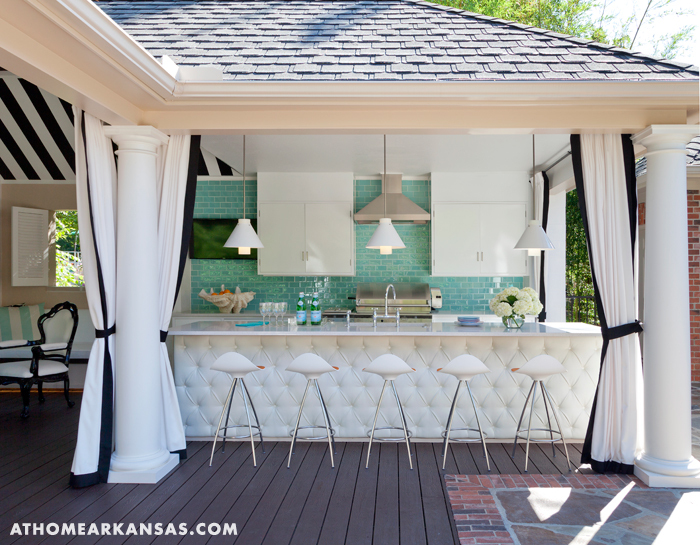 Five years after the completion of the interior design work in a sophisticated Northwest Arkansas home, Tobi Fairley returned to a former project to bring her signature bold and tailored style to the outdoor spaces. “The homeowners wanted an area to use for large family gatherings, as well as smaller groups, like their children and grandchildren,” she explains. To achieve harmony in the space, the family asked Fairley to work with Carolyn Lindsey of Yeary Lindsey Architects to make better use of the structures around the home’s existing pool. 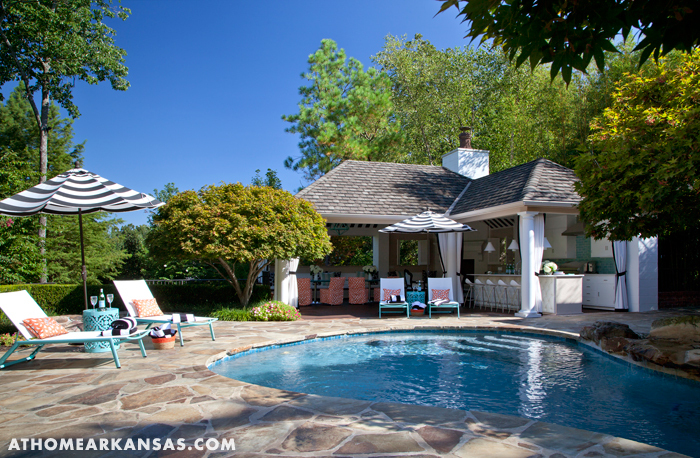 A trellis was replaced with a cabana and additional usable square footage was added to the existing pool house. She didn’t skimp on convenience on either, including a full-scale outdoor kitchen as well as multiple seating and lounge areas in the design. Not only did the pool and patio area need to be fuctional, but the homeowners desired an outdoor space that reflected their interior décor. 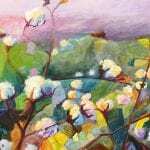 Known for her vivid patterns and bright punches of color, Fairley dove into the project with a clear vision for a refreshing outdoor escape. 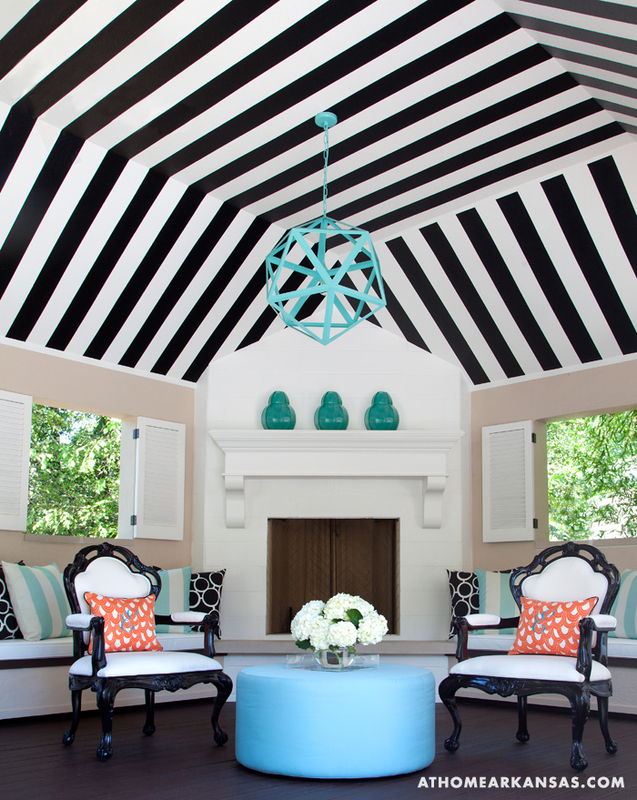 Inspired by the chic, boutique hotel pools the homeowners have visited around the world, she envisioned classic black-and-white stripes alongside more subdued elements that complement the interior of the home. 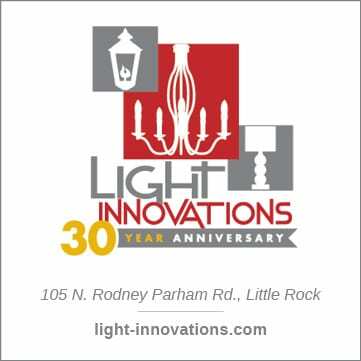 “We took color cues from inside the home, which is done in layers of aqua, light blue and steel gray and accented with orange tones from pumpkin to cinnamon,” says Fairley. 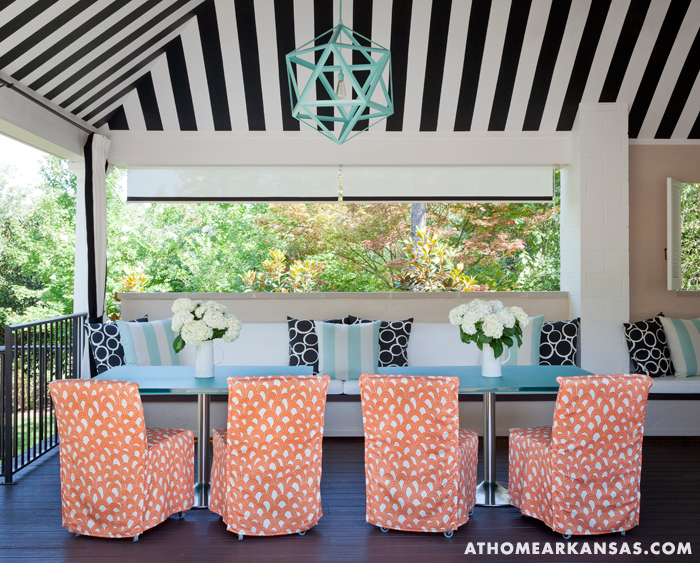 “Outside, we ramped up the volume on that palette.” The combination of aqua, orange, black and white is “edgy and fun,” says Fairley, who describes the homeowners as sophisticated and chic. 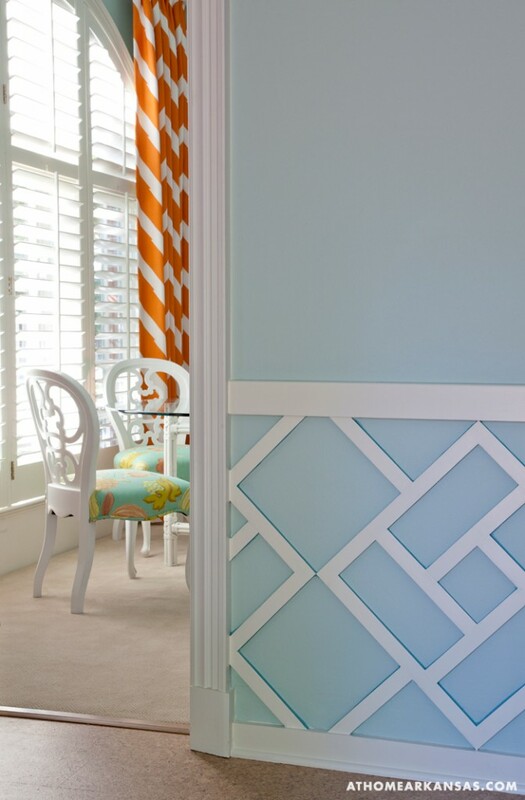 “Their style—and mine—unites very clean furniture lines and tailoring with dynamic and bold uses of texture, pattern and color,” she adds. 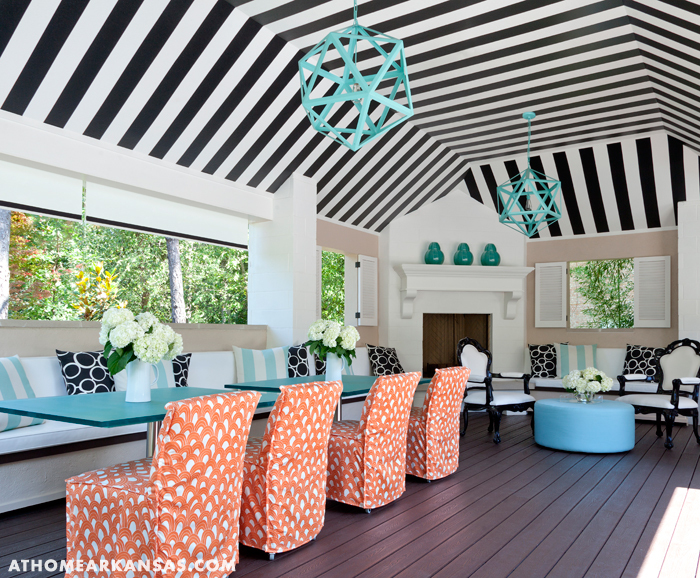 Thinking back to the space’s initial inspiration, a black-and-white striped ceiling gives the cabana the feel of an extra-chic poolside hut. 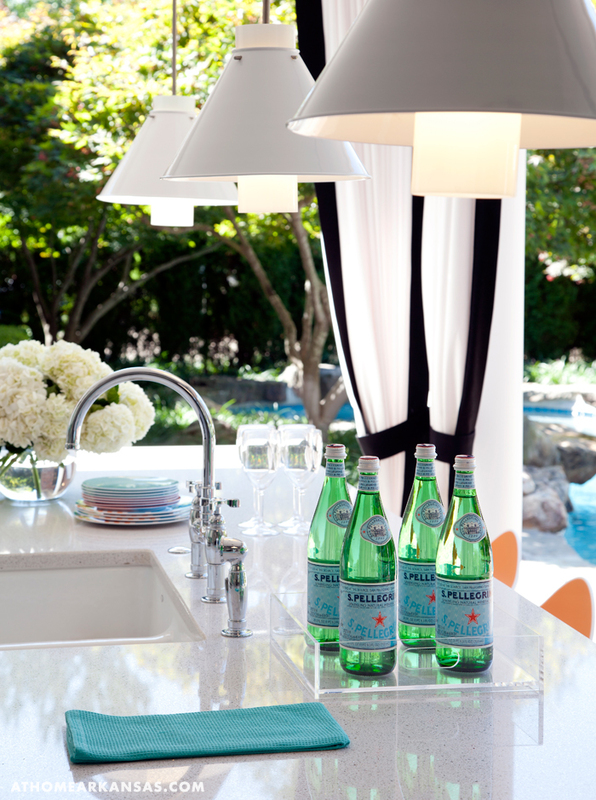 Overhead, geometric pendants from Restoration Hardware stand out thanks to a custom aqua paint job. 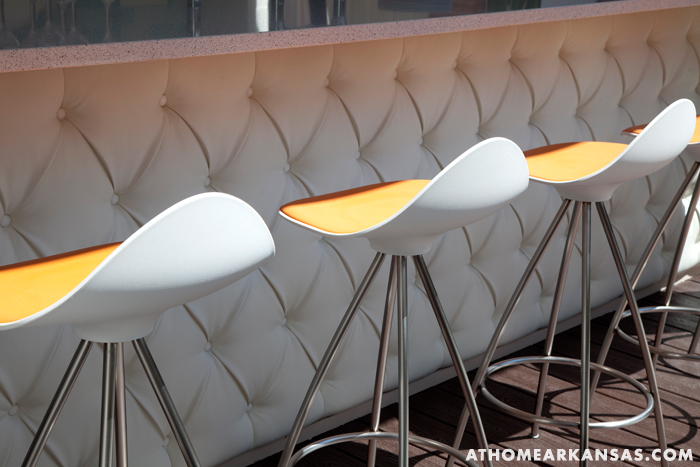 Banquette seating, also upholstered in white vinyl, stretches along two walls to provide ample room for the homeowner’s extended family and guests. 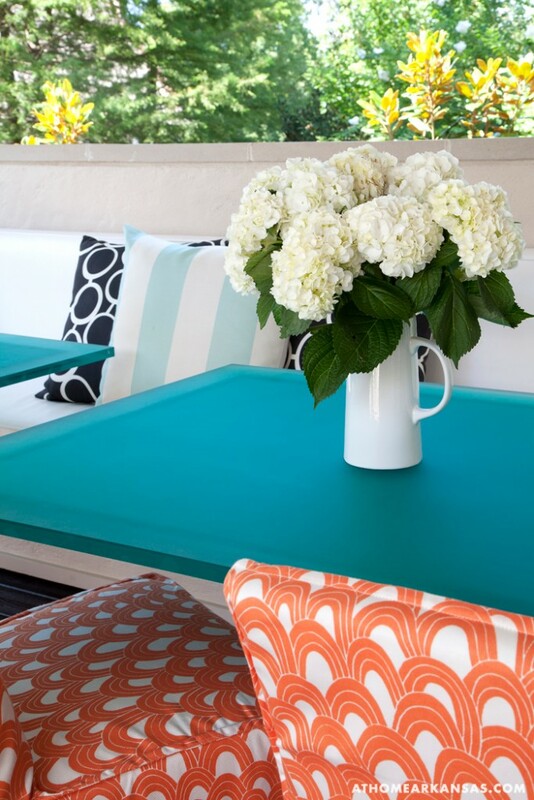 Custom aqua tables and Parsons chairs on casters keep the seating flexible, making the space feel less formal and easily changeable. A pair of more formal armchairs upholstered in durable Sunbrella fabric provides cozy seating beside the cast stone hearth. 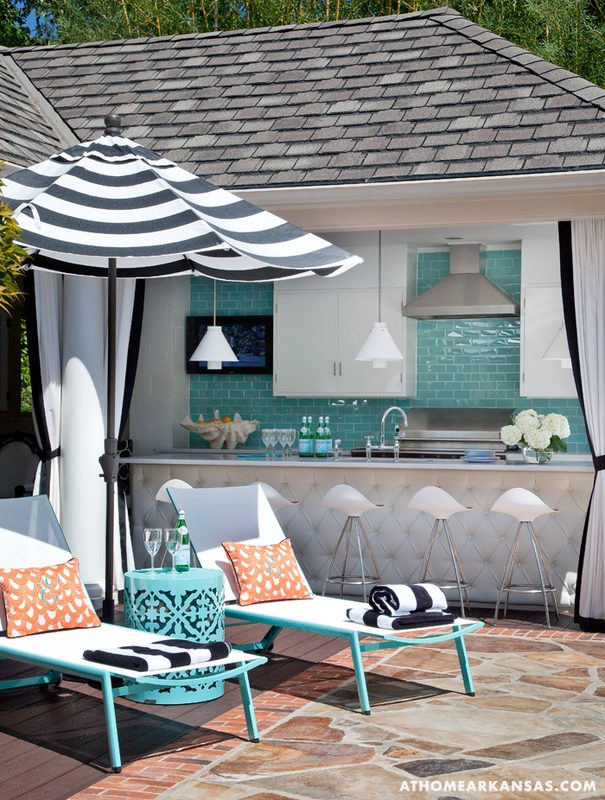 Around the pool, aqua chaise lounges by Caluco, black-and-white striped umbrellas and bold orange throw pillows continue the color scheme. 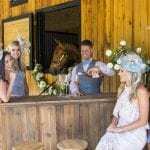 “I was aiming for a luxurious and streamlined look that still felt festive and friendly—and a little bit Hollywood—so I didn’t go the usual route of natural textures and colors. 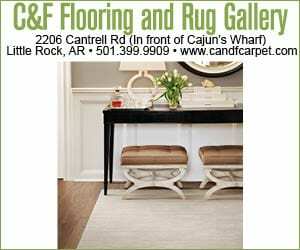 I wanted it to really pop,” says Fairley of the space’s accents. In the nearby pool house, the homeowners sacrificed a storage area to gain more living space. Frequented by grandchildren and long-term guests, the rooms are a lively extension of the home’s soothing color palette. 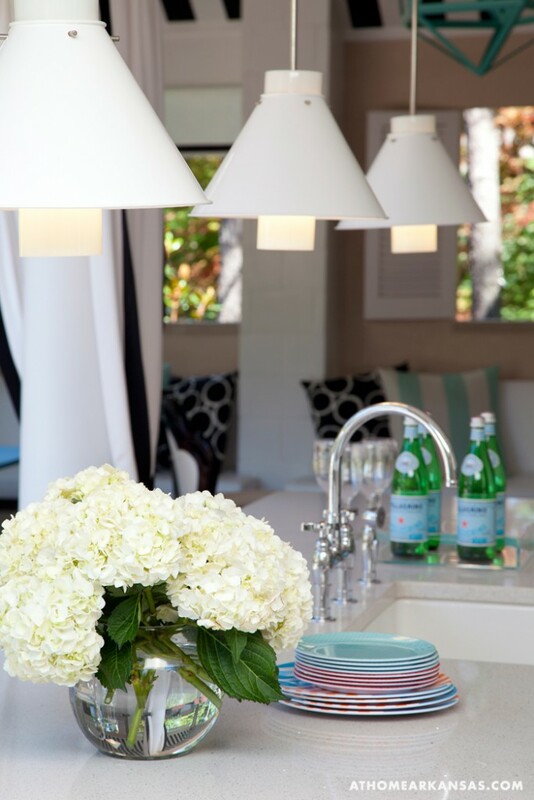 “Having designed the interiors of the home with lots of cool colors—monochromatic rooms with lots of texture, and a few, careful pops of color—I wanted to do something that was very dynamic yet still felt like a perfect fit with my vision of the home as a whole,” says Fairley. 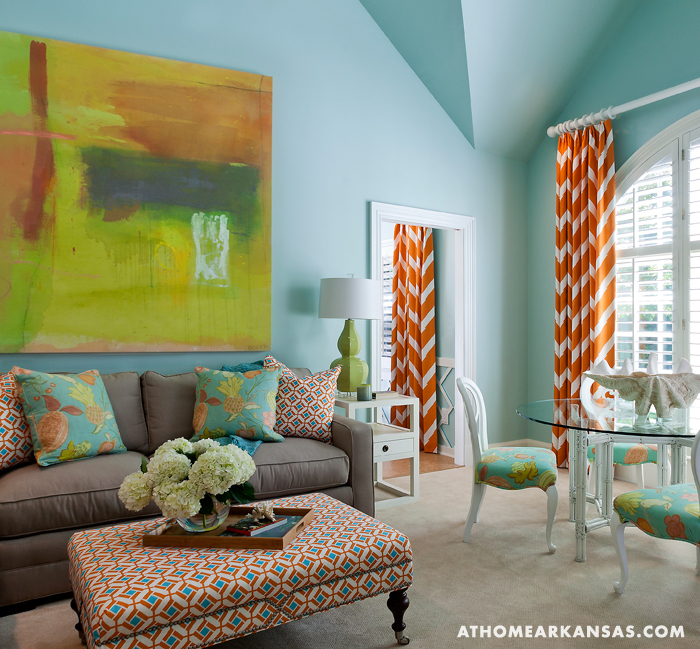 Turquoise walls, crisp white trim and fabrics in shades of blue, orange and green continue the flow, while signaling that this room is meant as a retreat from everyday life. 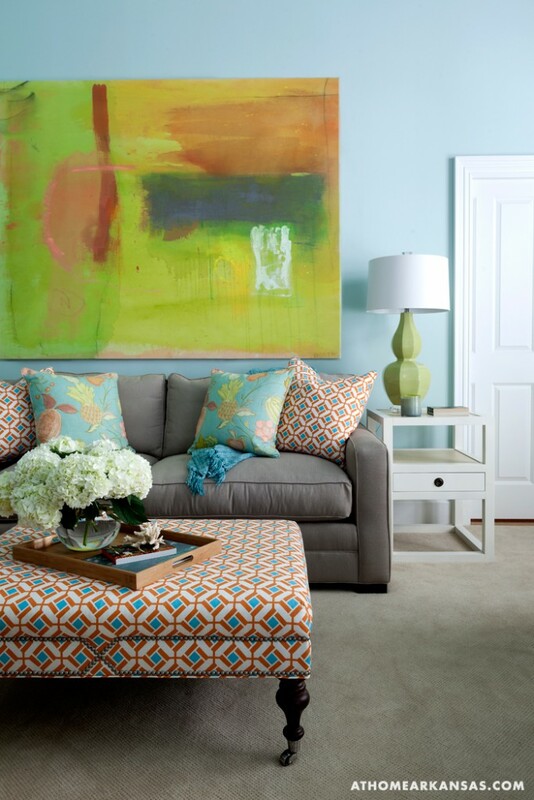 A neutral Lee Industries sectional is livened up with throw pillows made from fabric from Fairley’s own collection, Tobi Fairley Home, as well as more organic prints from Raoul Textiles. 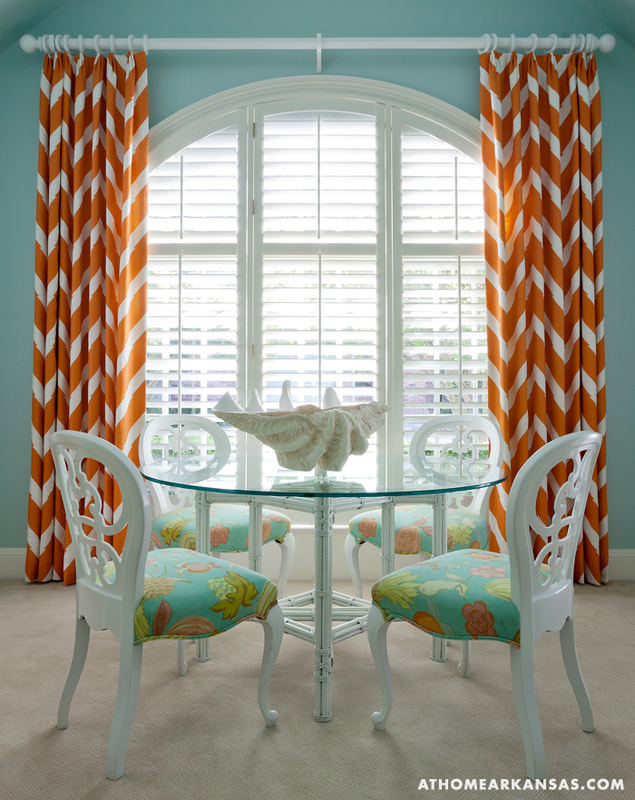 The daring orange curtains may appear to be an adventurous choice, but the warm tone pairs beautifully with the water-inspired wall color and coordinate with an abstract piece of artwork by Kansas City artist Jane Booth. 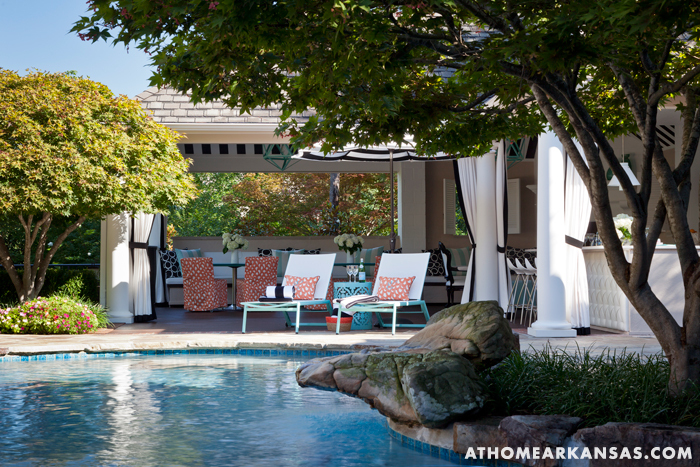 Indoors or out, the refreshing palette and artistically graphic design elements make this cabana and pool house a perfect fit for cosmopolitan houseguests and fun-loving grandchildren alike.